The ClayMate is a compact two-section shotgun cleaning tool. 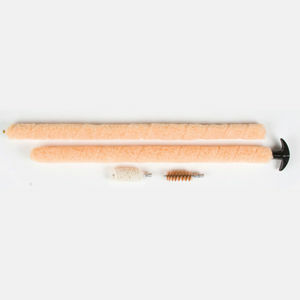 The soft fibres effectively pick up unburned powder, which is lifted by a screw-on phosphor bronze brush - providing unbelievably quick and effective cleaning. Also included is a screw on bore mop for applying a light coating of solvent or lubricant. total assembled length is 36", breakdown length is 19" for easy storage in gun cse or range bag. The ClayMate can easily be washed and reused.